Heat oven to 350° F. Line two baking sheets with parchment paper. Pop open the biscuit can and cut each biscuit in half lengthwise so you end up with 16 rounds. Add to baking sheets. Rinse, then cut off the tough ends of the asparagus spears. Then, cut each spear into 1 1/2-inch fingers. Top biscuits with a tablespoon or so of cheese, three asparagus fingers, a sprinkle of salt and pepper and a drizzle of olive oil. If there extra asparagus fingers, add them to the corner of one of the baking sheets, toss with olive oil and season with salt and pepper to enjoy as an extra snack! Bake 13-17 minutes or until golden brown. Half way during cooking, check to make sure the asparagus fingers have remained on top of the tarts. If not, replace them and continue baking. Bring on Spring, channel the bunny and give these fab mini tarts a whirl! They’re cheesy, buttery, asparagus-y little rounds of happiness and joy. These little cheesy asparagus tarts are perfect for brunch, apps or on the side for dinner … heck, eat ‘em for your midnight snack, for all we care, just make sure you eat one! 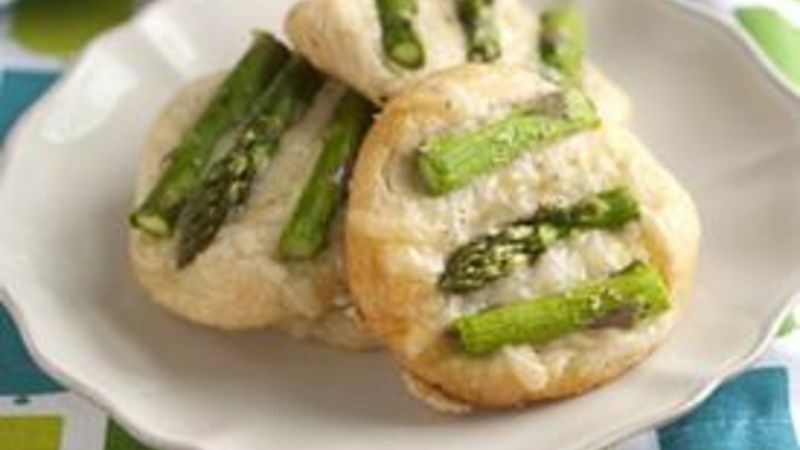 There are three stars that rock this show – Pillsbury Flaky Layers biscuits, sweet tender asparagus and CHEESE! We went a little fancy on ya and used a Gruyere and Swiss cheese blend, but use what whatever you have – we won’t judge! Give that asparagus a rinse, cut off the super-tough ends, then cut it into fingers. Grab the biscuits and pop open that can. Grab a knife and carefully slice each biscuit in half lengthwise. Don’t sweat it if a few aren’t perfectly round -- it’s no biggie. Line ‘em up on a baking sheet and top with cheese and a few asparagus fingers. Give ’em a sprinkle of salt and pepper then a tiny drizzle of olive oil. Just before you bake, throw any extra asparagus fingers onto the baking sheet … just snuggle ‘em into one of the corners, season with salt and pepper then drizzle with a touch more olive oil. Might as well have a snack, right? Bake the tarts until golden brown and delish! The cheese will be all melty, the asparagus tender and your mouth will be waterin’. Channel the bunny and hop on over to check the recipe, you’ll like this one! Adam and Joanne think that once you get over these fab tarts, you’ll definitely want more. For more inspiration, visit them at their blog Inspired Taste and their Tablespoon profile.